Are You Looking For A Good New & Used Drilling Machine? We have dozens of Drills for sale & in stock. A radial drill is a machine used to drive an abrasive wheel (or wheels). Depending on the grade of the grinding wheel it may be used for sharpening cutting tools such as lathe tools or drill bits. Alternatively it may be used to roughly shape metal prior to welding or fitting. 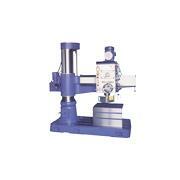 A drill is a machine tool used for boring holes with facilities for lowing the tool to the workpiece. There are many different types of drills, all set up for different applications..